Delicious flavours with depth, and a significant belt of heat, define the dishes at Jincheng Chinese Cuisine. The twice-cooked pork is incredible. I'm sweating when I slide the door to Jincheng Chinese Cuisine open. It's just before noon, incredibly hot outside. The sun bores through the bright windows into the dining room where a fan whirrs quietly, almost uselessly, on the ceiling. The restaurant is completely empty. I tentatively walk towards the counter and hear an "Oh!" from across the room, as a man scurries out of the kitchen to greet me. He tells me to pick any table, so I sit next to the window that overlooks Dresden Row. With a friendly, throwaway comment about the heat, my server brings me a tall glass of cold water while I wait. The glass is sweating more than I am as soon as the water hits it. My friend is delayed, so I leaf through the menu. The restaurant is quiet except for a hushed gurgling of water from the kitchen and the hum of a small fridge full of pop. The decor is sparse. A few prints with pandas, flowers or boats punctuate tall white walls. A small, brown Buddha props up a dry-erase board with the lunch special on the curved counter. Two bright red chilies hang above it. My friend arrives. We start with spring rolls ($1.99), dumplings ($7.99) and homemade Szechuan-style pickles ($2.99). The main portion of our meal is a combination of stir-fried chili beef ($15.99), twice-cooked pork ($15.99), rice cakes stir-fried with nappa cabbage ($13.99) and a small steamed rice ($1.99). Upon ordering, the restaurant comes alive with onomatopoeia: chop, sizzle, clang, chop, chop. The symphony of slicing doesn't stop until our server---who it seems is also the chef---comes out with the first few dishes. The dumplings are plump and tender, with slightly crisp jackets. The pork and cabbage filling is delicious, made even better by the tasty dipping sauce. The spring rolls are fat with cabbage, carrots and sprouts. The Szechuan pickles are remarkable. The cool mix of crisp carrot, pepper, ginger, onion and cabbage has a hint of sweetness that is perfect against the sultry depth of flavour rendered from the pool of chili oil it sits in. A little goes a long way, but it's addictive. By the time we're done our dumplings, the main dishes begin to arrive, starting with the beef stir-fry. It's a simple dish: thin slices of savoury beef coupled with discs of jalapeno in a chili sauce. The fresh, green flavour of jalapeno is the perfect foundation on which to build layers of heat. The Szehuan spices take the dish from simply giving my tongue a tingle to setting my lips on fire. The twice-cooked pork is also incredible. The pork belly has been boiled, then stir-fried. The result is tender, fatty ribbons of pork with crisp, toothsome edges. 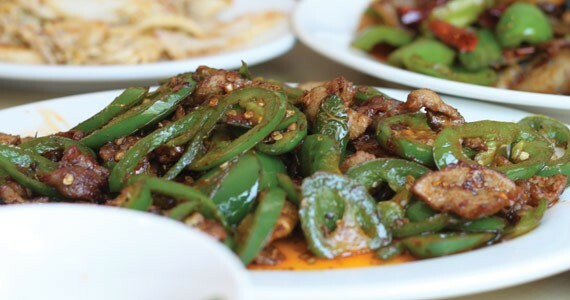 Green pepper, onion and dried chilies sit in an oily sauce that glows red with heat. By this point there are beads of sweat on our foreheads. The mildest dish, the nappa and rice cake stir-fry, still has a whiff of heat. The slight crunch of the nappa cabbage is great with the super-chewy bite of the tiny rice flour patties, and the delicate sweetness of the cabbage is made lovelier with the earthy sauce. I would happily eat this every day. Our water runs out part way through the meal, and goes woefully unfilled as our server looks after a second group that made its way in with an "Oooh, what's that?" as they walked by our feast. Our napkins are soggy with sweat and our throats parched by the time we get a refill. It's the only bump in what has been a smooth, hot ride. I walk home carrying a bag stuffed with boxes and thoughts turn to a dinner of leftovers. But first things first: I stop for milk.